We have over 200 standard sizes / models of sunrooms, solariums, conservatories and greenhouses. We can also customize a room to fit your existing architecture. 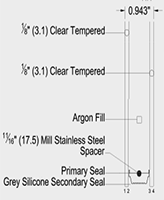 With all these standards available, you’ll save time and money on manufacturing costs. If you choose to customize your room, you’ll be treated to a completed structure that is second to none. 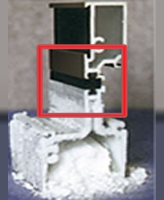 Thermally broken frames: Exterior metal does not touch the interior metal. The framing members have a polyurethane section that separates the aluminum components. Important because this will reduce the transfer of heat and cold from the outside of your home to inside the room. Because the frames don’t touch, condensation is reduced and frost on the outside frame doesn’t transfer to the inside frame. 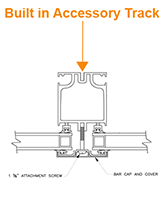 Internal “Tear Duct” Weepage system drains moisture efficiently to the outside of the unit, away from the windows. Our aluminum framework features 4 weepage channels! Important because every glass structure creates condensation when the outside air is a different temperature than the inside air. In addition, rain, frost, and snow contribute to condensation. 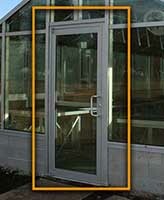 When installed correctly, our system will drain down to the sill where it is forced to the outside. Low awning windows. 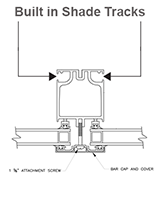 We recommend placing awning windows below the sight line. Important because you’ll want to have a full, clear view of your surroundings. That’s the reason you choose to have a sunroom, solarium or conservatory. Most of our competitors put windows in the line of sight. 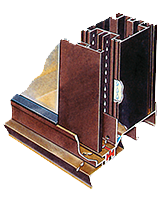 This causes an obstructed view through metal or screens. We want you to have the best view possible so you can see the great outdoors clearly. Built in shade tracks designed to fit Comfort Glide Shades. Important because, while you may enjoy the sunshine, there might be times you want to tone down the light and warmth. About half of the time you’ll find the sun to be beneficial in providing extra light and heat for your home. When the sun goes down, the shades can be drawn to preserve the heat in the room, like an extra layer of insulation. Important because exposed fasteners will allow dirt to collect around them and form dirt and moisture trails every time there is humidity outside. 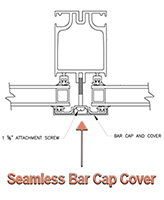 Our fasteners resist rust and are completely covered, hidden from view, by our muntin and bar caps. This gives your glass room a nice finished look while protecting the connections. Important because you might want to hang something from the frame structure. Plants and festive lights are just two of the ways people use the built in track. You won’t have to drill unsightly holes, the frame is ready for you to add any hooks for signage, flags, even fans. Wide bays (window width) of 36″. Important because you’ll want the best, unobstructed views. 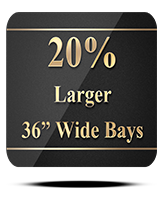 At 36″ our window bays offer a view 20% larger then our competitors. This allows us to insert hinged door, sliding glass doors and even french doors while maintaining a consistent, aesthetic framework across the entire unit. 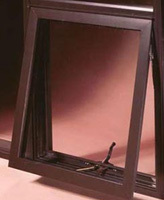 Tempered 15/16″ insulated safety glass with several hi-performance options. This is a dual pane window, with argon fill for better insulation. Important because people will be in the room. Tempered safety glass is strong. Most windows are made of annealed glass, which is easily broken causing a serious safety hazard. Tempered glass is not easily broken and, if accidentally damaged, will break in such a way to keep people safe. Important because you want to be able to efficiently heat and cool your home. 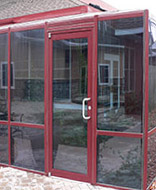 The hi-performance glass helps keep the room comfortable by controlling heat gain / heat loss. 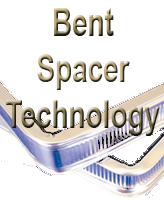 Bent spacer corners and dual seal technology. A single, non-corner splice in the seal instead of jointed corners. Important because you want the seal between your glass to hold for years to come. If you’ve ever seen condensation between the panes of glass you’ll appreciate the difference that our attention to detail makes. 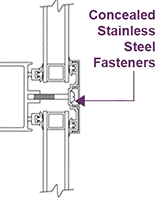 The non-corner splice and dual seals dramatically reduces the chance of seal failure. Quality frame finishes. Our finishes are electrostatically applied and meet AAMA standards for fading and chalking. Important because you want a finish that will look great for years. We have anondized and Kynar color options available. 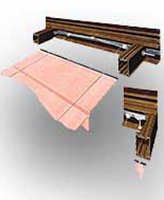 Comfort Glide Shade System with sun screen or insulated shades. Important because sometimes you’ll want to reduce the amount of light or enhance the overall interior aesthetics of your room. With the insulated shades, you’ll also be able to keep your room cooler during the summer and warmer during the winter. Factory fabricated windows and doors. Important because these accessories are made to fit our glass rooms. This ensures a high quality structure with great visual appeal and long lasting energy efficiency. Important because the way your room looks from the outside is just as important as how it looks from the inside. With the seamless bar caps the outside of your room looks attractive and has an extra moisture barrier. No visible screws or seams to impair the aesthetic appeal.